Sergeant Harry Cator was born in Drayton, Norfolk to a railway worker. He joined the British Army in September 1914 and arrived on the Western Front in June 1915 as a Sergeant in The East Surrey Regiment. At the Battle of The Somme in 1916 he was awarded the Military Medal for rescuing thirty six men from No-Man’s Land whilst under fire. 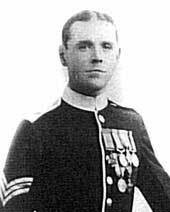 He earned his Victoria Cross and the French Croix de Guerre during the Arras Offensive. On 9th April 1917 his platoon had suffered heavy causalities; under fire Cator, with one man, advanced in the open to attack a German gun, and when his companion was killed, he went on alone. Picking up a Lewis gun and some ammunition on his way, he succeeded in reaching the enemy trench and killed the entire team. He held the end of the trench with such effect that a bombing squad were able to capture ten prisoners and five machine guns. Cator served in the Home Guard during the Second World War. He died in Norwich and is buried in Sprowston Cemetery.